Your week is probably not starting as auspiciously as it is for a group of Domino’s delivery drivers in Cincinnati, who plan to share a $1 million settlement in a wage-theft lawsuit. Each of the 163 drivers in the suit stands to receive about $6,000. WCPO reports drivers accepted the settlement in December, and a district judge is expected to approve it this week. 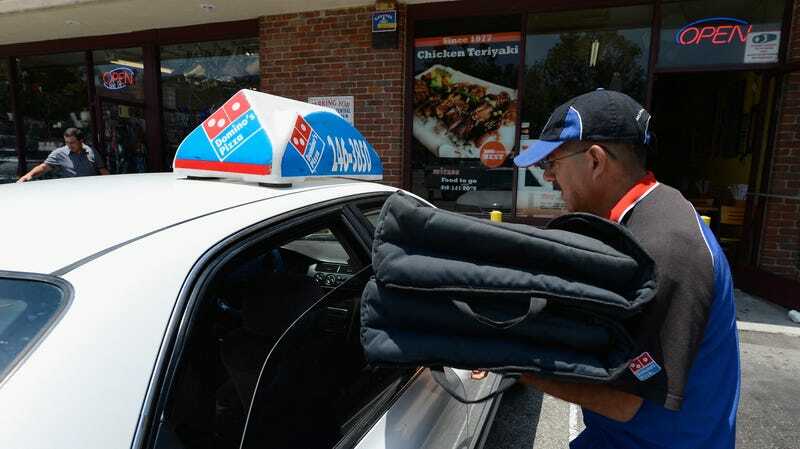 The drivers collectively sued a Domino’s franchise called Southern Ohio Pizza for unpaid wages and mileage; their lawyers from the firm Markovits, Stock & DeMarco have reportedly filed almost 20 such suits on behalf of delivery drivers across the country. “If approved, the drivers will receive an average of over $6,000 per person, which we hope is difference-making money for them,” the drivers’ lawyer Andrew Kimble told WCPO. At issue in this case was whether the Domino’s properly reimbursed drivers for vehicle maintenance and mileage, and whether the drivers were paid less than minimum wage when performing non-delivery duties. Paul Mullins, the lead plaintiff in the case, alleged he and other drivers were not properly reimbursed for vehicle maintenance and insurance, and that they were paid a tipped hourly wage that was less than minimum wage when they performed non-tipped tasks like preparing food or folding pizza boxes. In October, more than 400 Domino’s drivers won an $850,000 settlement in a lawsuit in Dayton, Ohio’s federal court. Those drivers claimed they were reimbursed less than they should have been for mileage driven as part of their jobs. A similar lawsuit against a Domino’s franchise is pending in Colorado. According to Pizza Today, “the leading magazine for pizza professionals,” pizza drivers may be paid either an hourly rate or a tipped-credit rate depending on state and local laws. Essentially, if a driver’s tips don’t meet the required minimum wage, the employer must make up the difference. Employers must also cover drivers’ fuel costs, repairs, and maintenance. The standard federal reimbursement rate for this is 55 cents per mile, which covers fuel, repairs, vehicle depreciation, and insurance. Oh, and while we’re on the subject of pizza delivery compensation, a PSA that drivers everywhere would like you to bear in mind: The delivery fee is not a gratuity paid to drivers. Tip accordingly, please. What the uff is Minnesota-style pizza?